It’s also the sort of thing The Crown could use more of. Elizabeth isn’t an easy figure to dramatize because she’s so internal and impartial—qualities that don’t lend themselves well to dramatic set pieces. But as the Churchill scene proves, there are ways to make her form of reserved leadership compelling too. Unfortunately, Elizabeth often winds up getting a little lost in her own series. 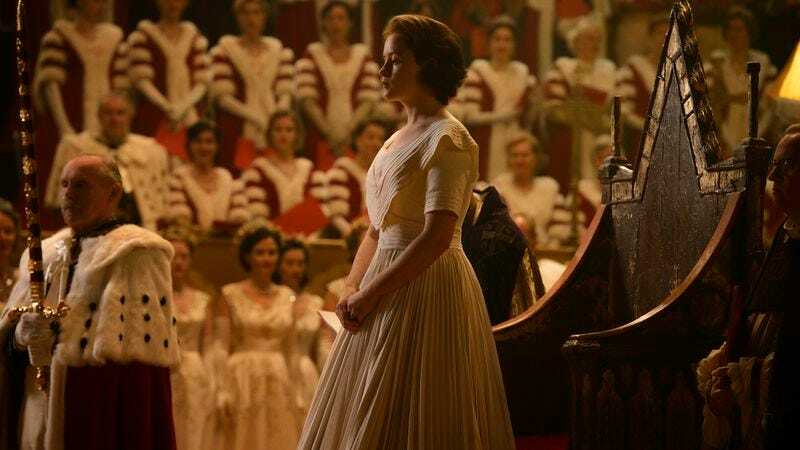 Continuing The Crown’s episodic structure, “Smoke And Mirrors” centers on Elizabeth’s coronation (any fallout from The Great Smog goes unmentioned). Though in some ways a technicality—after all, Elizabeth has been ruling since her father died—it’s nevertheless an auspicious event in her reign; one that marks her not just as a ruler, but as God’s anointed queen. The episode opens with the welcome return of Jared Harris as we flashback to Elizabeth’s childhood. Preparing for his own coronation, George calls Elizabeth into his office to have her pose as the Archbishop. It’s another lovely example of the unique bond the two share and a glimpse into the subtle ways Elizabeth was trained for her eventual reign long before she could fully grasp the concept. Notably, she invites Charles and Anne to join her during her own coronation practice too. Tradition, as ever, moves forward. But rather than stick with Elizabeth’s perspective, the episode largely uses Phillip and Edward as our point of view into her coronation. I wouldn’t exactly call it a misstep, since Phillip and Edward are both compelling characters in their own right. But it does feel like a missed an opportunity to dig deeper into its slightly opaque protagonist. Edward continues to be the closest thing The Crown has to a villain, and Alex Jennings again sinks his teeth into the chance to play such a simpering, egotistical yet in many ways tragic figure. Edward returns to London to visit his ailing mother, Queen Mary, and it’s jarring to watch him usher up some kindness for his family in person only to viciously rip them apart in his letters to Wallis. But those letters also reveal Edward as something of an unreliable narrator. He writes that his mother clung to her hatred of him until the last. But earlier we see her meekly beg her eldest son not to leave her side on her deathbed. Rather than acknowledge that complicated moment of affection, Edward sticks to the simpler narrative that his mother never forgave him. Whether that’s for his benefit or for Wallis’ is hard to say. If The Crown relishes in depicting Edward as a villain, it’s toeing the line more delicately with Philip, whom Elizabeth names chairman of her coronation committee. The Duke of Edinburgh emerges as both the most progressive and most regressive figure in this episode, which is a smart encapsulation of the ways in which even forward-thinking people can be limited by the prejudices of their time. Philip is spot on in his desire to democratize the monarchy by making it more accessible to everyday people. He and Elizabeth both believe the crown’s central job is to inspire and uplift the country. But while she’s afraid of making herself too accessible, he realizes that the new medium of television will only elevate the monarchy’s mystique, not diminish it. The Windsors are an incredibly insular family and it takes an outsider like Philip to push them out of the comfort zone of tradition to which they’ve become accustomed. Yet Philip is also the height of retrograde patriarchy as he throws what amounts to a hissy fit over the idea of being asked to kneel before his wife during her coronation. It’s a bridge too far for his masculinity and Elizabeth gets her most overtly feminist moment to date as she argues that a truly strong man would have no problem kneeling to both his queen and his wife. Though this episode contains a literal coronation, for my money Elizabeth and Phillip’s martial spat is the most compelling set piece in “Smoke And Mirrors.” It’s an extended sequence that’s allowed to unfold with the rhythms of a play. And Claire Foy and Matt Smith bring an intense chemistry to Phillip and Elizabeth’s biggest fight to date, which both sells the intimacy of their marriage and their fundamentally different points of view. As much as Philip’s arrogance is a personal character flaw, it’s also a reminder of just how differently we socialize men and women. As I keep drilling home in these reviews, Philip is simply being asked to do what hundreds of thousands of women have been asked to do throughout history. And the idea of the Queen Mother or Mrs. Churchill so openly pushing back against playing a subservient role to their husbands is simply absurd. It would never happen. But when you haven’t spent your whole life being taught to put other people’s feelings above your own, it’s not so easy to play that role on a national stage. Inequality often hides behind deeply ingrained societal norms, and flipping the gender script is a fascinating way to examine those norms in a new light. Philip does eventually kneel, just as Elizabeth agrees to put her coronation on TV, but it’s yet another tricky negotiation in the unconventional power dynamic of their relationship. It’s hard to read just what husband and wife are feeling in the moment Phillip genuflects, but it does seem like their fight might have created an irreparable shift in their marriage, perhaps even more so for Elizabeth than Phillip. As for the coronation itself, I found it a tad anticlimactic. While I understand the impulse to view the ceremony through the perspective of a black and white TV set, since that’s how so many people actually experienced it, I do feel slightly robbed of the pomp and circumstance I’ve come to expect from The Crown. And I can’t help but feel that the TV footage is as much of a financial shortcut as it is an artistic choice. Even a $130 million budget can’t replicate the true opulence of monarchy. The episode’s smartest decision is to use Edward as a foil for the inherent gravitas of the ceremony. At his viewing party in Paris, he mocks and belittles the ostentatious event with the viciousness of a live tweeter watching an NBC musical. His ultimate point is that the elaborate ritual is merely a way to elevate flawed human beings into false gods. Yet as much as he ridicules the monarchy, there’s still clearly a part of him that aches for the godlike status it once provided him. “We are mortals,” Edward explains when asked why the public isn’t allowed to view Elizabeth’s anointing. And that reality is enough to bring tears to his eyes and bagpipes to his lips. Matt Smith is so great at injecting just the right amount of charm into his performance. Without the right light touch Philip could be overbearing, but Smith makes him likable as well as pigheaded. The music is insanely heavy handed on this show, but given the ostentatious lives these characters are leading it actually doesn’t bother me that much. To some extent I want to defend Wallis Simpson, a woman punished simply for daring to get a divorce in an era in which that wasn’t socially acceptable. However, her potential Nazism (which still goes unmentioned) makes things a little more complicated.